Bridget Ellen Ahlstrom was born at 10:15 Sunday morning. She was 7 lbs 9.6 oz (one pound less than Elizabeth) and 19 1/2 in long (just the same as Elizabeth). I woke up at about 5:30 that morning and while I was using the bathroom, my water broke (which was VERY convenient for me mess-wise). We called Mom to come stay with Lizbeth, and since I wasn't having strong or regular contractions, waited till she arrived before heading to the hospital in Provo. We got there at about 7:00, and checked in without much hassle. Contractions were still light and irregular, so they started me on pitocin. I wasn't thrilled about that because it makes the contractions more intense and I wanted to try to avoid both the epidural -- which made me feel useless during Elizabeth's delivery -- and the narcotics -- which tend to make me feel out of control. About three hours later, things were really going strong. The contractions were coming hard and fast, and I would have taken the narcotics, but the nurse said it was too late. Thankfully, it was not too long after that that I felt something change, and knew that Bridget was coming. I remembered from the lamaze class we took before Lizbeth was born that you can't push while you're huffing, so I switched my breathing to that while the nurses rushed around getting the bed ready and the doctor in the room. Once they told me to push, I was doing OK until the bed got pushed up so far that I was being squished between the backrest and the stirrups/ "It's too much!" I yelled desperately. "No, no." The nurses said, thinking I meant the pain and contractions, "You're doing fine!" "The bed!" I insisted -- not finding the words I wanted. When they finally understood what the problem was, we discovered that I had been the one pushing the button with my own elbow. I thought it was pretty funny, even in the moment. It only took about three contractions of pushing, and Bridget was out and into the world. She was there on my chest, all covered in gook, but beautiful nonetheless. It all happened so fast at the end, that I didn't notice most of what was going on around me. Soon after she was toweled off, they took her away to clear her airways because she wasn't crying like she should. I was kind of in shock -- shaking like crazy, and kind of confused and sort of noticed as Peter called the grandparents, and posted to Twitter and facebook. They brought the baby back to nurse and bond, but she didn't seem very interested in sucking when breathing was such a challenge. Helena called Peter, and asked if he could post a picture, which he did with his spiffy iphone. After about an hour, they took Bridget away to give her eyedrops and have someone evaluate her breathing. They moved me to a long-term room, and made sure I was able to walk, etc. Then I settled down to wait for Peter to bring Bridget back. Several hours later, I found out that they had taken her to the NICU, put surfactant in her lungs, and had her on oxygen. They had here there all day Sunday, and most of Monday too. It was hard to have to ask whether it would be all right to hold my own baby, and even harder when they said no. At the same time, everybody was cheerful and treated her case as something temporary and routine. Her O2 saturation was good even when she was off the CPAP breathing tube, she just wheased a lot and it seemed like it was hard for her to breathe, so they decided to give her a little help. Monday morning, when she was still there, and not likely to come down soon, I tried pumping -- since they said, "Oh! if you don't do it in the first 12 hours, you could have trouble having enough milk supply." Well Shortage of milk was never my problem with Lizbeth, and it didn't look like it's be a problem this time either. I took two whole ounces (60 ml) of colostrum up with me to the NICU for my first visit of the day. When the Doctor saw it she burst out laughing, and told the nurse, "I wrote on her chart to give Colostrum as available, but you'd better not try to force all that down her throat at once. Just give her about five ml at a time." Mom brought Grandpa Roly and Lizbeth to visit, and so the two sisters got to meet for the first time. Lizbeth was impressed for about 30 seconds, and then was done with the baby and wanted attention from Mama. Grandpa Roly admired her fingers and tiny fingernails, and said, "Grabba Holt" as she held his finger, much to his delight. Monday evening, They let her leave the NICU and come to my room. We had annother visit from Mom and Lizbeth on Tuesday, and then early that afternoon, they suddenly said we could all go home. It was great to have our whole family together in our new house. We love Baby Bridget, and are thrilled to have her here with us at last. We got a lot of good wishes from people, and I wanted to document them here. Kirsa Van Dusen I hope everything goes smoothly! May 30 at 6:07am · . Patti Harvey good luck! keep us posted!! May 30 at 6:28am · . How nice! Just 20 minutes ago I woke up and prayed that you'd have a safe delivery soon. When I told Rachel, she said "Yaaay!" and Elliott started clapping. We're all excited for him to have another Ahlstrom cousin! Good luck. We will keep you in our prayers. Megan Kauffman Well, you got out of California, that's a point on your side. Prayers for all of you, and remember women have been having babies for thousands of years - don't let the doctors make you forget that. May 30 at 6:19am. Stefan Rauch Good luck May 30 at 7:39am. Peter Ahlstrom Karen says: "Half of those women died in childbirth. Well, maybe not half, but a lot of them." May 30 at 7:57am. Megan Kauffman *cringe* I won't argue with a woman in labor but that's not the best attitude to have going into it. May 30 at 8:03am. Tina Moore Ingles Good luck! Take good care of her! May 30 at 9:08am. Suzie Irby Great! Prayed for a safe and easy delivery and you've got a great attitude! I can tell you've done this before :) May 30 at 9:42am. Peter Ahlstrom Megan: the idea is that she's glad there's a doctor there. :) May 30 at 11:02am. Kathi Russell-Rader Prayers and well wishes for a safe delivery on the way, Peter. Keep me posted. May 30 at 11:09am. Suzie Irby Peter, you are very correct. Not only did lots of women die in childbirth but lots of babies too! For the life of me, I cannot imagine why people want to get back to all that mess. May 30 at 12:04pm. Peter Ahlstrom Bridget Ellen Ahlstrom has arrived! She's holding my finger right now. Karen is (I hope) getting some rest. May 30 at 12:11pm. 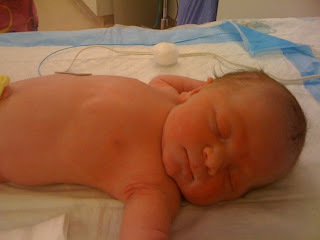 10:15, 7 lbs 9.6 oz, 19 1/2"
Peter May 30 at 10:31am. --Helena May 30 at 10:35am. May 30th is a good birthday. May is a good month for birthdays, right, those of you with may birthdays? Lesli May 30 at 10:56am. She is so cute. Her nose looks like Elizabeth's when she was new. That was super fast for a picture! Ellen Lynn Summerstay is what we were going to name daniel if he was a girl. Lesli May 30 at 11:01am. Congratulations! What a great name, too! She's beautiful. She does look like Lizbeth! --Helena May 30 at 11:02am. We were trying to park at Niagara Falls when you called; it took like an hour. Then when I listened to your message I could only understand a few words here and there, but I got the idea when I heard the weight. Yay. -Betsey May 30 at 9:38pm. Yeah! So glad to hear that she made it safely. -David June 1 at 10:29am. Peter Ahlstrom It's a girl! 7 lbs 9.6 oz, 19 1/2". Mom and baby are doing fine. 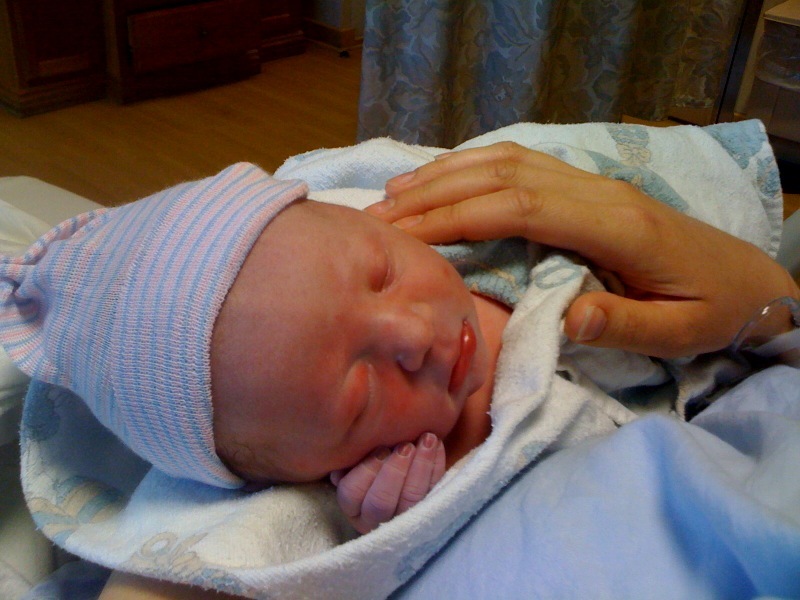 Eric Neve Congratulations May 30 at 11:01am. Brandis Pennington Congrats!!! May 30 at 11:01am. Vanessa Kennington Christenson congrats! May 30 at 11:02am. Christopher Wheat Wonderful Peter! All the best to your family! May 30 at 11:17am. Eric Lake Congratulations! That's awesome. May 30 at 11:18am. Kathi Russell-Rader Congratulations, Peter. How wonderful. May 30 at 11:21am. Sabrina Pratte Congrats!!! May 30 at 11:23am. Josh Walker Congrats, Peter! May 30 at 11:36am. Eric Lake What's her name? May 30 at 12:13pm. Peter Ahlstrom Bridget Ellen. May 30 at 12:15pm. Valerie Hill Congrats!!!!!!! Enjoy the newborn stage and treasure every moment.... It wont last long enough! May 30 at 12:18pm. Abby Grimshaw Dawe Congrats! Glad mom and baby are doing well. May 30 at 12:57pm. Suzie Irby Congratulations!!! May 30 at 1:15pm. Devin M. Taylor congratulations!! May 30 at 1:27pm. Fen Eatough Woohoo!! Congrats! May 30 at 2:18pm. Christina Feinauer Jones Congratulations! Fun to have two girls! May 30 at 2:54pm. Patrick Sullivan congraturation May 30 at 4:21pm. Lincy Chan Congratulation! She looks really cute! May 30 at 5:36pm. Matthew Bushman Congratulations! May 30 at 9:41pm. Diann T. Read Congratulations! May 31 at 7:03am. Michael Johnson Congratulations! May 30 at 12:15pm. Valerie Hill Shes a beauty!!!! Better go ahead and by the shotgun so you can go target practicing! May 30 at 12:21pm. Kristina Kugler Congratulations! May 30 at 12:24pm. Karen Gonzalez Congrats! She looks a little like Elizabeth. May 30 at 1:03pm. Suzie Irby That was fast! May 30 at 1:17pm. Mi'chelle Trammel AWWW!!!! Peter, she so cute! Uber congratulations! May 30 at 1:25pm. Joseph Zuehl Geesh, weren't you just on your way to the hospital? Man, in any case congratulations!! May 30 at 4:12pm. Peter Ahlstrom We got up at 5:30 (water broke) and then she was born at 10:15. Karen was not in active labor when we got to the hospital (mild contractions every 20-40 minutes) but since her water had already broken they felt pitocin was a good idea. So once labor started it was less than 3 hours. And the final push came on rather suddenly--and the doctor we were expecting to use was in a c-section, so we had a surprise doctor. May 30 at 4:23pm. Vanessa Kennington Christenson Whoa! Carl Earnstrom (you remember him, Peter? He was the editor at TLE before me) his wife had a baby today, too! How's that for coincidence? Oh, and she's a cutie! Congrats! May 30 at 4:27pm. Deanna Hoak Congratulations!! May 30 at 5:19pm. Jeffrey Creer Congrats to you and Karen. May 30 at 5:39pm. Laura Duffin Congrats, Papa (& Mama)!!! :-D :-D May 30 at 6:55pm. Charisa Player Congratulations! May 30 at 7:51pm. Kalyani Poluri thats an angel of a baby.. Congratulations.. :) May 30 at 11:20pm. Update from Peter. The baby was born this morning at 10:15 and is named Bridget Ellen. 7 lbs 9.6 oz, 19.5". Right now they've got her in the NICU due to her working slightly harder to breathe than they'd prefer. She may go to Karen's room anytime but it's hard to say. Janice West Warren Congratulations!!!!! May 30 at 6:14pm · . Tina Moore Ingles Congrats and I'll be praying for the baby! May 30 at 6:52pm · . Phyllis Kimmel So glad to hear about Karen and Bridget Ellen. My prayers for all of you... May 30 at 7:04pm · . Kirsa Van Dusen Congratulations! What a beautiful name! I hope she gets to go stay with Karen soon! May 30 at 7:59pm · . Martha Holt Henderson Congrats! Wow, early and everything! Keep us updated, you'll all be in our prayers. May 30 at 8:39pm · . Jill Pavic Whoo hoo! Congratulations! May 30 at 8:39pm · . Linda Stay Danielson Congratulations! Hope all continues to go well with the baby and Momma. May 30 at 9:20pm · . Dorothy Brown Larson Wonderful news! Congratulations. May 30 at 10:26pm · . Vanessa Kennington Christenson I love the name! Congrats May 30 at 11:09pm · . Judi Moore Blessings to Bridget and Karen, and joy for Peter and Elizabeth!!! May 31 at 12:31am · . Jaime Predmore Congratulations Karen and Peter :) May 31 at 6:32am · . Ethel Pastron Congrats!!! I hope all continues to go well. May 31 at 7:55am · . Marci Stay Stringham I am so happy to hear the good news. Give Karen all my best and congratulations to the both of you. May 31 at 8:21am · . Kathy Bradley congratulations. Hope Karen and Bridget are home soon. May 31 at 9:34am · . Peter Ahlstrom She's out of the NICU now and will be here in Karen's room in a couple of minutes. May 31 at 4:52pm · . Peter Ahlstrom And she's here! May 31 at 5:12pm · . Helena Ahlstrom Jole Whoa, I had never noticed that. May 31 at 3:03pm. Karen Gonzalez What's her name? And yay 4 getting out early. How's Karen doing? May 31 at 5:39pm. Peter Ahlstrom Bridget Ellen. And Karen is doing well. May 31 at 5:58pm. Kathi Russell-Rader Congratulations Peter. What a lovely name. My youngest niece is a Bridget. May 31 at 8:07pm. She's had a really good day so they've brought her down to the room with Karen. They have her on antibiotics that they need to give her until tomorrow, after which they'll do some blood work. If it looks at that point like she's not trying to fight anything off, she'll be going home with us. Peter May 31 at 5:11pm. Why is she on antibiotics? Was she in icu? She was in the NICU until about 4:30 today: she was having a bit of trouble breathing. Over 95% oxygen levels, but huffing so they had her on O for a while, then just on air with positive pressure. They took that off this morning and she's done fine. They may be doing an antibiotic just becasue of all the lines they put in? Rebecca May 31 at 5:57pm. That sounds like Daniel. They said with him that whenever newborns have trouble breathing they start them on antibiotics immediately and do tests to see what's causing it later, because if it's pneumonia or suchlike, if they do the tests first, they could get into a very serious condition by the time they get them on antibiotics. So they put daniel on them immediately, and then found he didn't need them, but they have to taper them off slowly, so he was on them for 3 days, and in nicu for three days, even though he was only on oxygen for the first day. They said the trouble breathing was because he had trouble transitioning. He was grunting too. I never found out his oxygen levels, but i think they were pretty low at first. I'm glad she's doing fine. THanks for the pictures. She's cute. Lesli May 31 at 6:46pm. Elliott didn't go to the nicu, but he also had to get oxygen right after he was born. He was just grunting and not crying when the pediatrician did his routine checks on him. I'm glad Bridget doing fine. She's adorable. Rachel June 1 at 5:26am. You are invited to view Rebecca's photo album: Bridget May 31 at 6:04pm. She's adorable. What's the pink stuff on her foot? -Steve May 31 at 8:15pm. Probably tape: she has an IV in one foot and they put a sensor on the other and also take blood out for tests. -Rebecca May 31 at 11:57pm. the pink is red light shining through from one of the sensors -- the one that reads pulse rate and oxygen saturation. in an adult it would be clamped like a clothespin on your finger. She also had a temperature sensor, blood pressure cuff, an IV, and EKG electrodes to get heart beat and respiratory rate. The thing I was most impressed with was the velcro headgear for keeping the CPAP breathing tube in place on her nose. With so many things just taped on willy nilly, Bridget's feet and ankles are in sad shape with her sensitive skin dry and cracked where it hasn't been poked or rubbed away entirely. This headgear though was obviously well designed for function and comfort. Lesli's explanation about them givinng antibiotics first and looking for infections later was exactly what they told me for Bridget. It was hard not being able to hold her much that first day, but the NICU staff all seemed so calm about everything the were doing with her that at no point did I feel really worried about her long term health. -Karen June 1 at 4:41pm. -Heather June 1 at 6:03pm. Helena Ahlstrom Jole Yay! June 1 at 2:42pm. Peter Ahlstrom And we are home. June 1 at 3:16pm. Mark Ahlstrom w00t! June 1 at 3:24pm. Suzie Irby Nice! June 1 at 3:25pm. Stacy Whitman I didn't realize you were still at the hospital when I emailed yesterday! You're just as busy as anybody right now. June 2 at 9:30am. Kirsa Van Dusen Hooray! June 1 at 3:58pm · . Tina Moore Ingles I'm so glad she's here and safe :) June 1 at 5:23pm · . Howard Tayler Congratulations! June 1 at 5:23pm · . Martha Holt Henderson Glad she's here safely! Let me know what I can do to help! June 1 at 5:32pm · . Phyllis Kimmel Best wishes, Karen. Bridget Ellen is getting a great family. June 1 at 9:53pm · . Rachel G Hunsaker Congrats!! June 1 at 10:50pm · . Michele Beachler Congratulations to all! And I think it's cool she was born so close to her mom's birthday :) June 2 at 6:05am · . well. And do is Karen. Great! I'm glad everyone is doing well. Peter, how long will you be able to take off work? I am glad she is o.k and you had a quick and safe delivery. I love that you documented this so well! Good luck two is fun but also tiring, keep up your strength and take some time for you!